I am happy to invite you to the Brisbane launch of Journey into Truth and Question Time 3 by Archbishop Mark Coleridge on Saturday, November 26, at 7 pm at St Kevin’s parish, Geebung. The launch will follow the 6 pm vigil Mass, which I will celebrate. 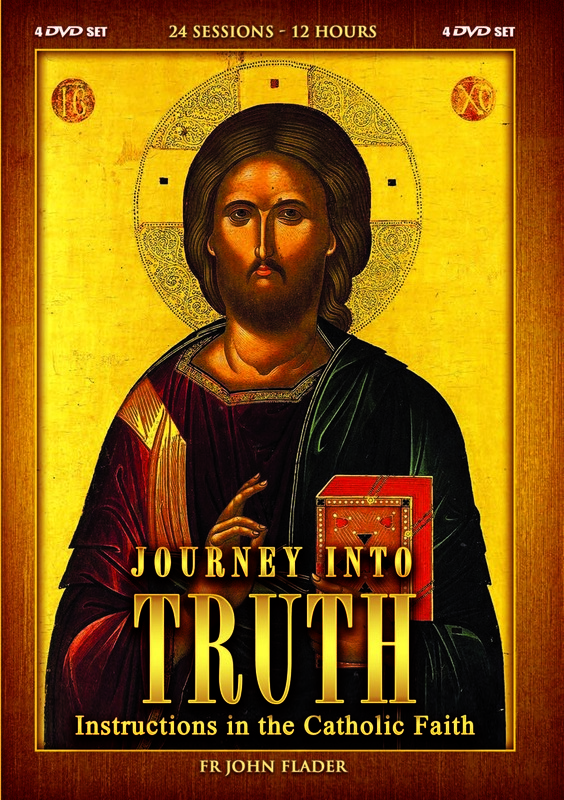 Journey into Truth is a set of DVDs of instructions in the Catholic faith, with 24 half-hour talks based on the Catechism of the Catholic Church. A book with the same title contains the full text of the talks. EWTN has asked to include the talks in their programs and St Joseph Communications will distribute the DVDs in the U.S. Question Time 3 is the third volume of questions and answers on the faith published in The Catholic Weekly and other Catholic papers. I hope you are able to attend and I ask your prayers for the success of the launch. This entry was posted in News and tagged Archbishop Mark Coleridge, book launch, Brisbane, EWTN, Fr John Flader, Journey into Truth, Question Time 3, questions and answers on the Catholic faith, St Joseph Communications on November 17, 2016 by frjflader. On Friday, 4 January, some 1500 people attended the funeral of Virginia Monagle in St Mary’s Cathedral, in Sydney. Virginia passed away on Saturday, December 29, finally succumbing to secondaries in her liver and bones from the breast cancer which was diagnosed four and half years ago. I had taken her Communion and heard her confession at home on Christmas Day. Frank took her to hospital on Thursday night, December 27, when her pain increased markedly and she died there. Cardinal Pell was the principal celebrant of the Mass and eight other priests concelebrated. The singing was provided by the Tangara choir with Sarah Ampil singing the Responsorial Psalm and Andrew Lloyd Weber’s Pie Jesu after Communion. More than 100 students from Tangara, Redfield, Wollemi and Montgrove provided a guard of honour at the main entrance after Mass. It was truly a splendid funeral for one who had spent her life at the service of the PARED schools. What follows is the text of my homily at the Mass. “If they experienced punishment as men see it, their hope was rich with immortality; slight was their affliction, great will their blessings be.” Virginia experienced considerable affliction, pain and discomfort especially during the four and a half years of her bout with cancer, but also at other times in her life. But, as the Holy Spirit says, this affliction was slight compared with the blessings that await her. Indeed, to die is to go home, to go to the house of the Father, to go to where we belong. Here on earth we are only wayfarers, travellers, tourists, living in tents. We are just passing through. Our destiny is eternal life with God in the Father’s house. St Paul describes it in the second reading, writing to the Corinthians: “For we know that when the tent that we live in on earth is folded up, there is a house built by God for us, an everlasting home not made by human hands, in the heavens” (2 Cor 5:1). Blessed Pope John Paul II, on the very day he died, expressed this same hope, the hope of finally going home. At one point, knowing that death was fast approaching, he said to those around him: “Let me go to the Father’s house.” Yes, to die is to go home, to go to the house of the Father. And the way there, as we read in the Gospel, is Jesus himself, “the way, the truth and the life.” Virginia followed that way, she believed the truth and now, we pray, she enjoys eternal life with God. The souls of the virtuous are in the hands of God. I still remember distinctly how I first met Virginia and her sister Suzanne almost 40 years ago. I was giving a talk in a seminar for teachers in Creston College at the University of New South Wales. Among those attending were two strikingly attractive girls who after the talk asked some very intelligent questions that showed the depth of their faith. I couldn’t help asking myself, “Who are these girls?” I was soon to find out. As an aside, many years later I was talking with a woman who said she thought Virginia and Suzanne were the most beautiful girls she had ever met. Now for those ladies here who are getting jealous, you can relax – the woman hadn’t met you when she said that. But it is not a matter of physical beauty. What truly matters is beauty of soul, of character. As Suzanne pointed out in her words of remembrance, Virginia was filled with that. Her mother Eileen was a woman of great faith and piety and, even though her husband Victor did not become a Catholic until shortly before their 50th wedding anniversary, she brought up her two girls to be very strong in the faith. From the time she joined Opus Dei Virginia was ever faithful to her plan of daily spiritual activities, including the Mass, mental prayer, the Rosary, spiritual reading, reading of Scripture, the Angelus and so on. This gave her a very deep and personal relationship with Our Lord, with Our Lady, whom she loved very much, and the saints. And she did everything possible to share her faith with others. Frank tells me she would often engage even strangers, like taxi drivers, to talk about life and family and faith. In this year of faith, when Pope Benedict is inviting the Church to grow in understanding of the faith, to live the faith more fully and to share the faith with others, Virginia has given us a strong example. Soon after her marriage to Frank 35 years ago in St Canice, Elizabeth Bay, Virginia and Frank began to plan for the children God would send them. Virginia wrote about it in the book Women of Hope, compiled by Linda Baraciolli and published in 2009. The book relates the stories of women who have come through adversity and have faced it with hope. Virginia’s is the first chapter in the book and in it she describes beautifully and sensitively how she and Frank began their marriage confident that God would bless them with children and they made the corresponding plans for them. But then, as the years passed and the children didn’t come, they realised that God had other plans for them and they accepted those plans wholeheartedly. St Josemaria had often spoken with childless couples and he would urge them to use their time and talents to look after other people’s children. Virginia and Frank did just that. From the beginning they were very involved, along with Suzanne and many others, in the establishment of the PARED schools Tangara and Redfield, and later Wollemi and Montgrove. Virginia served on the Board of PARED from the beginning until her death. Through her involvement with the schools over these many years, and her other activities, Virginia touched the lives of far more children and parents than she ever would have imagined, certainly many more than she would have reached had God given her children of her own. All the thousands of children who have studied in the schools over the years and their parents have benefited in some way from Virginia’s prayer and work. The decision to celebrate her funeral in this cathedral which, as we can see is full, to accommodate all the people who would want to attend bears witness to this, as does the presence of Cardinal Pell, to whom we are all very grateful. Significantly Our Lord called Virginia to himself on the eve of the feast of the Holy Family. She had helped many families during her life, not only through Pared but also through her writing and talks all over the world in defence of marriage and the family, and it is as if Our Lord wanted to reward her for this by calling her on that day. Virginia touched people not only through the schools but also, and perhaps more importantly, through her personal friendship with them. Over the years she would often ask me to pray for the many people she was trying to bring closer to God through her personal conversations with them, and through the talks she was giving. The most lasting legacy anyone can leave is to bring someone closer to God, because the fruits go on for generations and, really, for all eternity. Virginia can give thanks to God for an abundance of such fruits. I told her in her last week of a priest friend who had asked God to let him die of cancer because he saw three great benefits to be gained. First, he would know he was dying and would have ample time to prepare. Second, he would be able to receive all the sacraments. And third, his suffering would help in great measure to make up for his sins, so that he might shorten his time in Purgatory or perhaps avoid it altogether. Virginia had all these blessings. She was receiving Communion and confession, and also the anointing of the sick, at home in the days before she went to hospital. She also had the joy of receiving these sacraments in hospital the day before she died. She was well prepared. She is one of those people of whom we have great confidence that they went straight to heaven. But since we can never be sure, we continue to pray for her and we offer this Mass for the repose of her soul. If she does not need the prayers, God will direct them to someone who does. And we can entrust all our prayer intentions to her too. She will be a powerful intercessor before God. Virginia, as I said, wasn’t afraid to die. Only a few days before her death she told me her great concern was not for herself but rather for Frank and Suzanne and how they would cope. As for herself, she looked forward to meeting Our Lord and Our Lady, and also her mother, father and other relatives and friends who had preceded her in death. Her very last words on the night before she died, words which were barely audible in her weakened condition, were “Never doubt”. She was most certainly referring to the existence of life after death, of heaven, and to her confidence in going there. She didn’t want anyone to doubt this. She was full of faith and hope. She knew that the souls of the virtuous are in the hands of God and she looked forward to meeting him. Let me conclude with a little story about Virginia that has two phases, separated by some 40 years. When Virginia was still in high school or university, she went to a party outside of Sydney and her mother stayed up, praying that she would be safe and reading a book about St John Bosco, to whom she had great devotion. The book told how on several occasions, when St John was being attacked, a white dog would suddenly appear to protect him. St John saw that dog as his guardian angel. Meanwhile at the party some boys began to criticise the Church and the Pope and Virginia felt uncomfortable, so she moved to a different seat on the veranda, some distance away. A friendly white dog came up and put its head on her lap, as if to comfort her. At the end of the evening she asked whose dog that was, and the others, who were also on the veranda, said they hadn’t even seen a white dog. When she got home she told this to her mother who saw the obvious meaning in the events. We jump now to the day before Virginia died. Out of the blue she said she could see a white dog on the horizon. May her guardian angel lead her safely home to the Father’s house, may Our Lady, Gate of Heaven intercede for her, and may she rest in peace. The souls of the virtuous are in the hands of God. This entry was posted in News and tagged education, virginia monagle on January 6, 2013 by frjflader.